Last Saturday Michael and me attended the “4. Linuxinformationstag Oldenburg“. Because of the name “Linux info day” I though it was mainly targeted at first time users, but the audience was wide spread from beginners to long time Linux users. We arrived at 10:00 and doors were to open at 11:00, but when we built up our booth, the first visitors were already showing up. 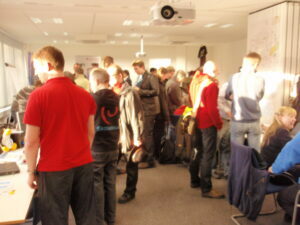 At 10:30, there were already a lot of visitors and at 11:00, the small exhibition room was overcrowded. It got a little better once the talks started, but the whole day there really was a lot of people. I guess nobody expected such a success, especially because the weather was really bad, still a lot of snow in Oldenburg. Our Booth consisted of two tables with two laptops and two XOs. The XOs served as an eye catcher and attracted a lot of people. Fedora was also very interesting for them because we and Sidux were the only real distributions on the event. The rest was ether projects such as Cacert and OpenOffice or companies. We gave away round about 80 Fedora discs (Live media and installation DVDs), stickers and a few T-Shirts. The event took place at KDO, (Communal Data processing Oldenburg), which is a joint-venture of Oldenburg and the surrounding counties that does all the IT services in the area in public administration, schools and so on. They are already using Linux a lot, but unfortunately only on servers. Only 2 of their employees run Linux on their workstations and I was glad to hear that one of them uses Fedora. I was happy to meet our fellow contributor Robert Albrecht again, whom I hadn’t seen for a long time. Robert did an interesting talk about Verinice. I did a talk too, and as you may have guessed already it was about Fedora, more precisely about our foundations and development model. The title was “Fedora – community driven development”. I originally prepared it for Chemnitz Linux Days, but it was rejected due to the large number of submissions (BTW: My LXDE talk was accepted). I will upload the slides later. Although I had one of the last slots at 17:00, the room was still full of people, not a single chair left. This and the interesting questions and discussions after the talk make me think that the audience really enjoyed my talk. I also met Dr. Claudia Neumann again. She is really amazing: She is not only a medic but also a programmer and she ported APW Wiegand to Linux all by herself. We had a nice conversation on the social event that took place in the evening. We had dinner and some beers and altogether it was a really nice and successful event. Thanks everybody for making it happen, especially to Frank and the other guys from KDO and the sponsors, namely to LWsystems, Univention and bytemine. Three cool companies dedicated to Linux and FOSS. With their support we can make the 5. Linuxinformationstag next year even bigger. Looking forward to see you there!